Since the heady days of the 80's when I regularly skipped Public Administration lectures in favour of the local bar's Happy Hour, I have always been partial to a cocktail or three. No celebratory event would be complete without something iced, shaken or stirred then strained into a cute glass. I don't even mind a teeny brolly adorning it. I love creamy cocktails, sparkly cocktails, fruity cocktails, and concoctions long and short but I have never before been faced with one containing vegetables. This week I was challenged by Discover Kale to create a gin-based cocktail featuring, you guessed it, that amazing superfood, kale. Kale is an excellent source of the B vitamin, folate ( a form of folic acid) with 69µg in every 80g of cooked curly kale. Folate plays a role in normal formation of blood, and supports the immune system to function normally. Gram for gram kale contains 17 times more vitamin C than carrots. I used raw kale in my cocktail recipe. I did a bit of research and discovered kale as a cocktail ingredient is more common that I'd anticipated. Mostly people make smoothie-type drinks with or without alcohol added. I'm not a big fan of the texture of most smoothies so decided to use Kale like a botanical, soaking raw leaves along with slices of fresh lime in gin. 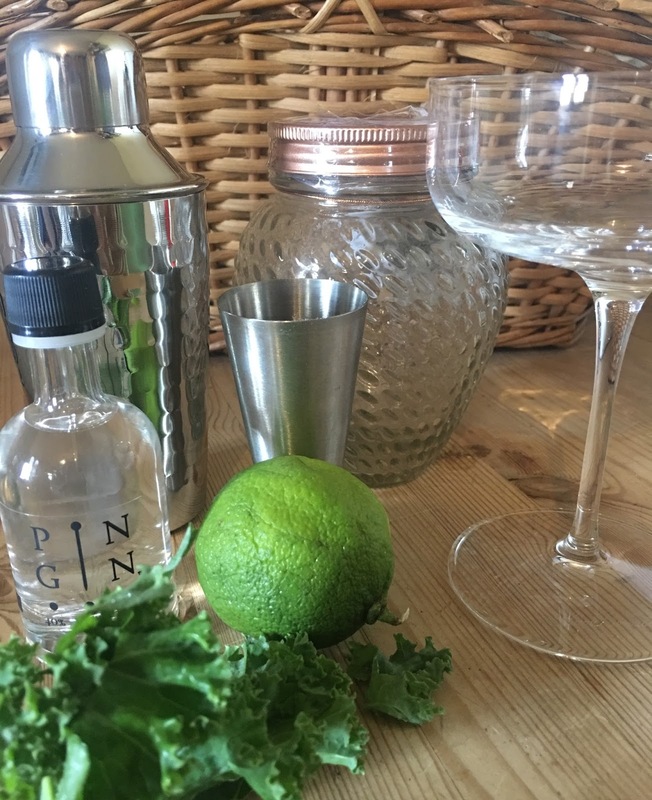 As I only wanted to make one glass of what I dubbed "Green Fingers", I used a handful of Kale leaves, 5cl of Lincolnshire's Pin Gin and half a lime, sliced. I shook the mix up in a lidded jam jar then left to infuse for 24 hours. I then strained the mix into a cocktail glass, added 25cl of peach flavoured sparkling water for sweetness and to make it a softer, longer drink, then garnished with a slice of fresh lime. It was delicious! I loved that the kale gave the cocktail a gentle green tinge and seemed to add a freshness and depth to the drink. I have no idea if soaking raw kale in gin allows any transfer of vitamins but since I cooked the rest of the kale I bought with Bratwurst sausages, smoked bacon, onions, potatoes and garlic in one of my favourite autumnal one pot slow cooker recipes, I know I got my dose of healthy (and tasty) goodness regardless of the nutritional state of my cocktail!